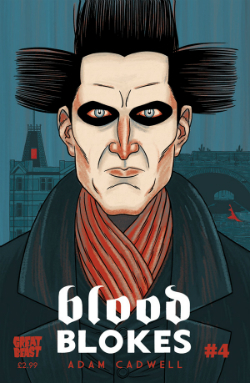 “Vampire fiction for readers who hate vampire fiction” was the soundbite I used to encapsulate my feelings about the last issue of Adam Cadwell’s dark comedy when I reviewed it here at Broken Frontier last summer. Eschewing the conventional trappings of contemporary vampire storytelling – there’s no pallid, posing, “sparkly” protagonist or undead/teen love triangle nonsense here for example – Cadwell has instead chosen to create a world of blood-sucking shirker philosophers; adapting the conventions of the subgenre to his story rather than being a slave to the usual clichés that surround the vampire world. The first three issues of Blood Blokes introduced us to uni dropout Vince whose New Year’s Eve celebrations looked like they could get no worse after he was dumped by his girlfriend. That assumption was proven wrong when he was attacked and killed by a bat-like creature on the same night, resulting in his transformation into a fanged supernatural entity three days later. Taken under the wing(s) of three slovenly vampire flatmates Mike, Arianna and the glum Douglas (see front cover for #4) Vince slowly came to terms with his new predicament and its repercussions. When last we left him the call of his old life had finally proven too much… with disastrous consequences. While #4 takes on a somewhat more serious tone, in keeping with the tender finale of the previous instalment, there’s still enough of that dry Cadwell wit to ensure there’s a wry smile or two here. 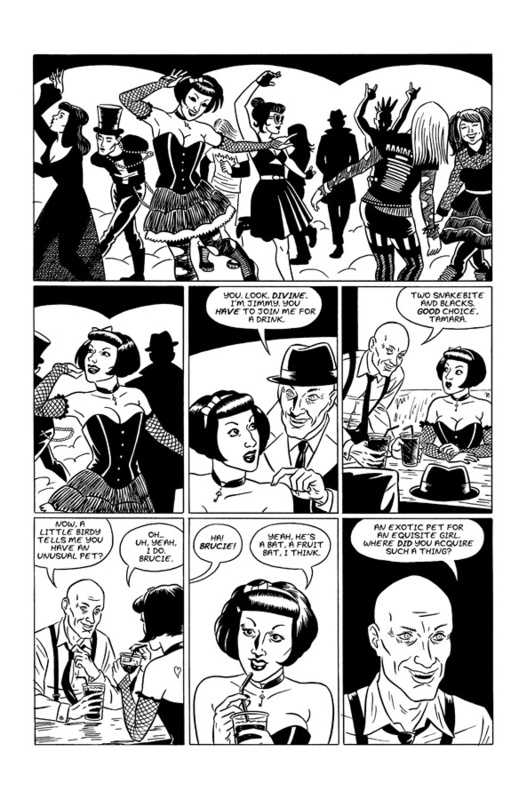 A deadpan Douglas line about messy eaters will amuse within the context it’s delivered, and the visual tics of the mysterious stranger pursuing our “heroes” will be of note to those who enjoy a spot of pop cultural referencing in their sequential art. But, first and foremost, this is the issue where we begin to realise that the fun but disposable slacker humour of the first few parts wasn’t quite as throwaway as we thought. There’s something subtler going on now as it gradually dawns on the audience that there’s a reason for the ennui that has infected the lives our cast of players; that eternal life is pointless when it’s as aimless and monotonous as this. It’s a lesson that Vince is only beginning to learn but one that is already proving a hard study. Once again, Cadwell’s visual pacing shows all the hallmarks of an artist who is supremely confident in the mechanics of his craft. 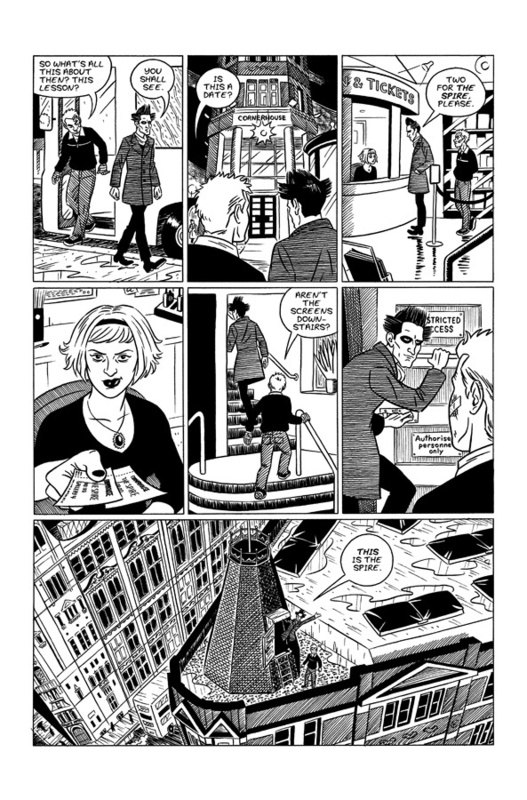 There’s an early sequence (left) that pans across the city while the lyrics of Daniel Johnston’s ‘Devil Town’ play across the background only to pull back sinisterly to the issue’s antagonist. 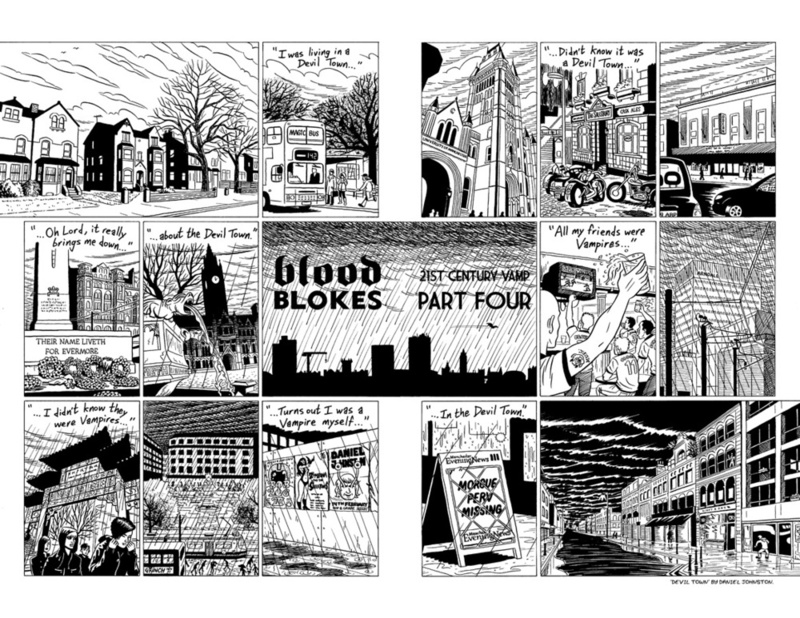 It’s a powerful contrast of Blood Blokes’ secret supernatural world with the oblivious, everyday lives of the rest of Manchester’s denizens; a theme that continues throughout. Once again, the crisp yet shadowy black and white art is a perfect means of presentation for a book that is unafraid to descend into a dark underbelly of clandestine terror, and Cadwell’s command of panel-to-panel storytelling – his innate understanding of the peculiar narrative tricks of comics to convey movements in time and space for dramatic effect – is textbook in its delivery. 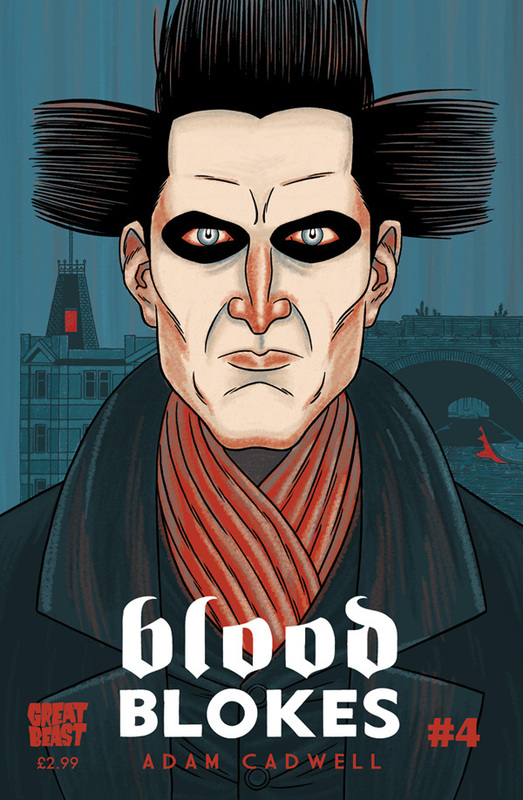 What’s so very clever about Blood Blokes #4, though, is Cadwell’s ability to manipulate the extremes of his audience’s emotions. Moments of acute wit and gross-out slapstick horror sit side-by-side with sequences of deeply affecting pathos. It’s a reminder of the tragi-comedic nature of Blood Blokes and its emphasis on extracting the profoundly human from the utterly inhuman. A significant gap between issues this time round, perhaps, but it was well worth the wait for a comic that remains accessible, character-led and a paragon of the Great Beast publishing ethos. 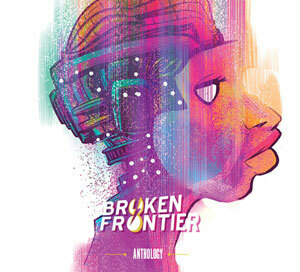 For more on Adam Cadwell’s work check out his site here. 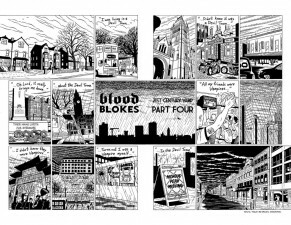 Blood Blokes #4 is published by Great Beast and is available on their online store here priced £2.99 for print or 99p for digital.